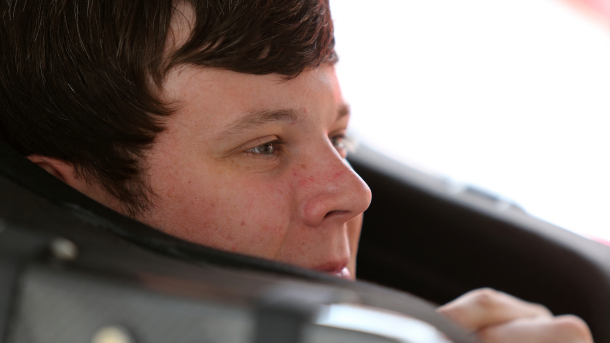 Erik Jones earned the pole for the first of two Xfinity Series heat races Saturday morning at Bristol Motor Speedway. Jones topped the field with a speed of 125.914 mph. “Starting up front is big any time at Bristol, whether it’s a heat race or main,” Jones said on Fox Sports 1. “It’s just nice to start up front. Hopefully, we can stay there. “Pretty cool to get the pole here. It’s been a couple weeks where we have been second, so it’s nice to finally get that pole and give us some momentum for the race today. 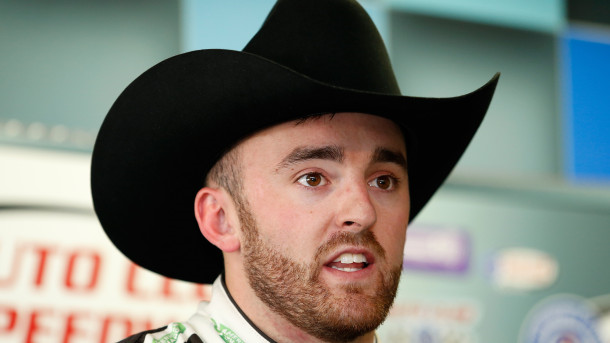 Austin Dillon was second fastest. He’ll start from the pole for the second heat race. His speed was 125.543 mph. 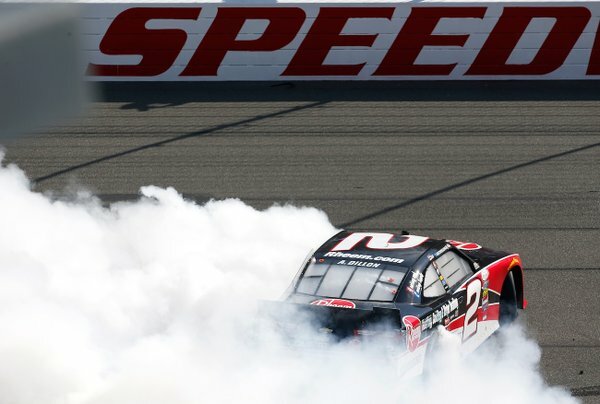 Austin Dillon capitalized on the misfortune of race leader, Kyle Busch, blowing a tire on the final lap, and goes on to win Saturday’s 2016 NASCAR XFINITY Series (NXS) TreatMyClot.com 300 at Auto Club Speedway (ACS). This was Dillon’s first series victory and fourth top-10 finish of the season, his seventh series career victory in 102 races and his first series victory in four races at ACS. 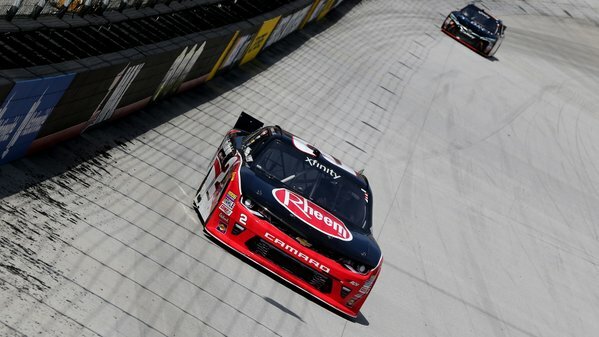 Following Dillon and Busch (led the most laps – 133 out of 150) to the drop of the checkered flag were Darrell “Bubba” Wallace Jr., finishing third, Daniel Suarez fourth and Elliott Sadler finished fifth. Rounding out the top-10 finishing positions were Kevin Harvick finishing in sixth-place, Brendan Gaughan seventh, Kyle Larson eighth, series Rookie of the Year (ROTY) contender, Brandon Jones ninth and Justin Allgaier brought home 10th. With his fourth-place finish, Daniel Suarez continues his points lead in the series and leaves Fontana with a 10-point lead over Elliott Sadler residing in second. Time of Race: 2 Hrs, 05 Mins, 52 Secs. Up Next: The series takes the next two weeks off and returns to action on Friday, April 8th, for the O’Reilly Auto Parts 300 at Texas Motor Speedway (TMS). The race is scheduled to get underway around 8:50 p.m. (ET), and FOX Sports 1 will provide television coverage of the event. 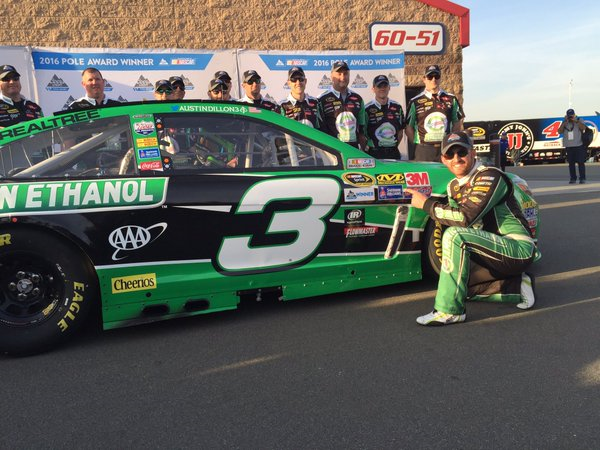 Austin Dillon, with a qualifying lap speed of 188.482 MPH, captured the 2016 NASCAR Sprint Cup Series (NSCS) Auto Club 400 pole award on Friday, and will lead the field in the start of Sunday’s race at Auto Club Speedway (ACS). A new series qualifying track record at ACS was established during the second round of qualifying, when Denny Hamlin ran a lap speed of 188.511 MPH, breaking Kyle Busch’s previous record of 188.245 MPH – which he set on Feb. 27, 2005. This was Dillon’s first series pole and third top-10 start of the season, his second series career pole in 90 races and his first series pole in three races at ACS. Last week’s series event winner, Kevin Harvick, qualified on the outside pole with a lap speed of 188.329 MPH, and he’ll be followed by Denny Hamlin (187.637 MPH) starting third, Ryan Newman (187.276) fourth and Carl Edwards (187.222) starts fifth. The defending series champion, Kyle Busch (187.212 MPH) will start from sixth, while Trevor Bayne (186.916) starts seventh, series Rookie of the Year (ROTY) candidate, Chase Elliott (186.795) eighth, Joey Logano (186.557) ninth and Jamie McMurray (186.345) qualified in 10th. For the fourth consecutive series weekend, only 39-drivers attempted to fill the 40-car field; therefore, no on failed to make the starting lineup. 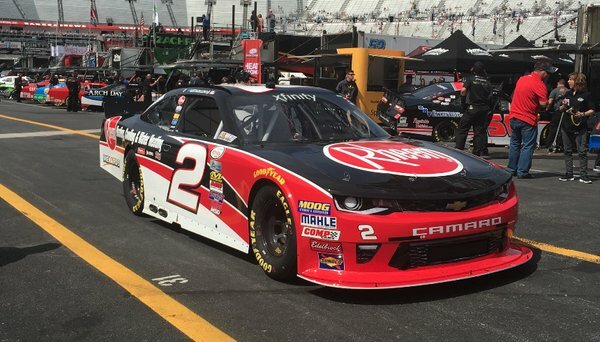 On Saturday, the teams return for two more practice sessions beginning with a morning session from 11:00 a.m. – 11:55 a.m. (ET) on FOX Sports 2, and then their “Happy Hour” (final) session from 2:30 p.m. – 3:25 p.m. (ET) on FOX Sports 1. The 20th annual Auto Club 400 is scheduled to get started around 3:50 p.m. (ET) Sunday afternoon on FOX. In the final 2016 NASCAR XFINITY Series (NXS) practice session for Saturday’s TreatMyClot.com 300, it was Austin Dillon – with a lap speed of 176.622 MPH – at the top of the speed chart at Auto Club Speedway (ACS) early Friday evening. Fastest in the first session, Kyle Busch, posted the second fastest lap speed of 176.013 MPH in this session, and he was followed by Ryan Blaney (175.863 MPH) who was third, Ty Dillon (175.623) fourth and Kyle Larson (175.588) was fifth. The current series points leader, Daniel Suarez (175.404 MPH) was sixth-fastest, while series Rookie of the Year (ROTY) candidate, Erik Jones (175.200 MPH) was seventh, Jeb Burton (174.600) eighth, Dakoda Armstrong (174.351) ninth and Ryan Reed (174.334) rounding out the top-10 fastest drivers in the “Happy Hour” (final) practice. The teams will return on Saturday at 12:15 p.m. (ET) on FOX Sports 1 for qualifying to determine the starting lineup for that afternoon’s race, and Tony Stewart currently holds the series qualifying track record at ACS with a lap speed of 185.941 MPH – which he set on Feb. 26, 2005. 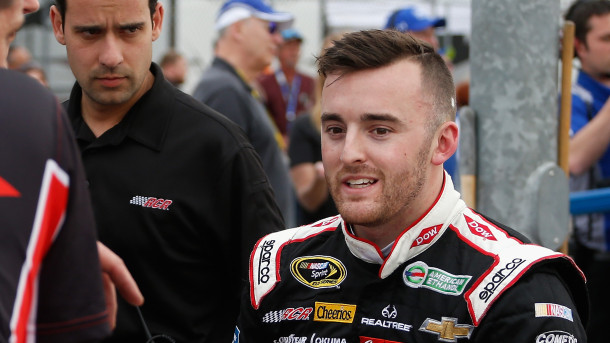 Friday afternoon in the 2016 NASCAR Sprint Cup Series (NSCS) at Auto Club Speedway (ACS), Austin Dillon – with a lap speed of 188.511 MPH – was the quickest in the first Auto Club 400 practice session. Second quickest in the session with a lap speed of 188.432 MPH, was Martin Truex Jr., and he was followed by Kevin Harvick (188.304 MPH) who was third, Ricky Stenhouse Jr. (188.289) fourth and series Rookie of the Year (ROTY) candidate, Chris Buescher (187.823) was fifth. Later this evening at 7:45 p.m. ET on FOX Sports 1 qualifying will be held to determine the starting lineup for Sunday’s race, and it has been just over 11-years (02/27/2005) since Kyle Busch set the current series qualifying track record speed of 188.245 MPH at ACS.